This is such a simple & healthy recipe that anyone can make. 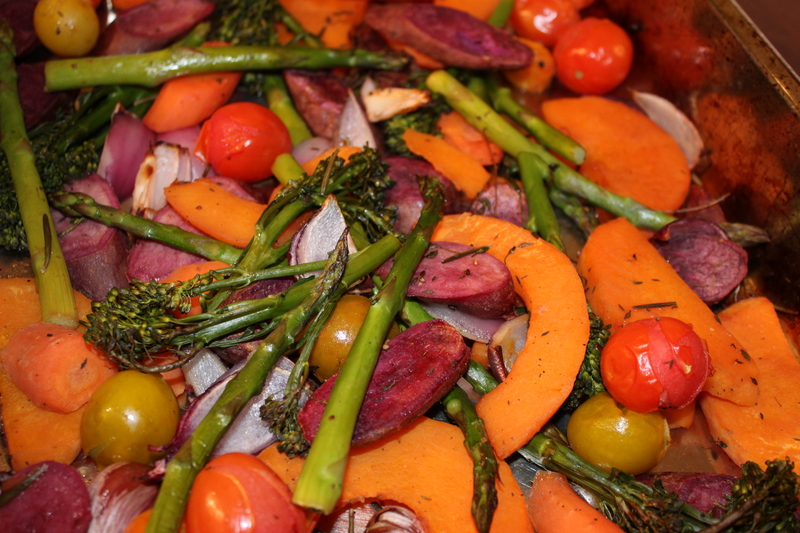 Chop the vegetables and place with some coconut oil into a large roasting pan. Season the vegetables with sea salt and fresh ground pepper. Proceed to make your sauce. Stir to blend. Pour the sauce over the vegetables & toss well to coat. Sprinkle with warming spices, if you like such as curry, nutmeg, a touch of cinnamon or some thyme. Roast for 30 to 45 minutes or until the vegetables are tender. Serve with cooked brown rice or quinoa & add a good quality protein of your preferred choice. I enjoyed mine with chilli chickpeas. Seasonal vegetables are packed with all the natural antioxidants our bodies require to protect us from seasonal illnesses & keep us energised & in peak condition. I have used a variety of brightly coloured vegetables because they are packed with phyto-nutrients. Red onions are a excellent source of vitamin C, & dietary fibre. They are rich in flavonoids & quercetin due to their colour, which are powerful antioxidants. Onions like garlic used in this recipe are anti-inflammatory & anti-viral so have good immune protecting qualities. Purple potatoes are packed with four times the amount of antioxidants than standard white potatoes. They also benefit from good levels of phyto-nutrients & plenty of fibre. All potatoes are high in potassium, which helps to regulate blood pressure. Purple cabbage & broccoli are cruciferous vegetables, which are probiotic foods & they possess sulphur-containing compounds, which have been shown to have cancer-fighting properties. Mushrooms are a good source of selenium, copper, niacin, phorphorous, & potassium. They are an anti-inflammatory food, containing high levels of beta-glucans compounds that keep immune cells alert, plus a powerful antioxidant called ergothioneine that helps lower body inflammation. The source for this dish contains good omega 3’s and the apple cider vinegar is wonderfully alkaline for your body & will support your natural stomach acids to digest this dish with ease.